The Down Street Underground Station was practically doomed from the start to a short operational life. The residents of the wealthy Mayfair area where it was to be built were not keen on having a Tube station on their doorsteps, believing it would entice “undesirables” into visiting the posher parts of the city. The Great Northern, Piccadilly, and Brompton Railway had tried to purchase land so that all their stations along the Piccadilly route had entrances on the main road, but no one was willing to let them buy such a prime site around Down Street. Instead, they had to make do with building on a side street, necessitating construction of longer subterranean passageways to bring passengers from the lifts to the Underground platforms. When the station opened on March 15, 1907, it immediately suffered from low passenger numbers. The residents of Mayfair could afford other methods of transport, the location made the station harder to spot, and it was close to other, more convenient stations on the same line. By 1932, Down Street was closed for service. This was not the end of the station’s use though. In 1939 it was repurposed as an underground bunker to be used by the Railway Executive Committee, the organization in charge of keeping Britain’s railways running during the Second World War. The long tunnels and platforms were converted into offices, dining rooms, bathrooms, and dormitories. A popular story has it that the dimensions of the corridors running along the outside of the offices were planned to be just wide enough for a tea trolley to roll along. The executives could arrive at the bunker at street level, entering through the old building. But when it came to leave, they could choose a different route. There was still a short section of accessible platform, and if an executive left a red lamp there, the next train would stop so they could board the driver’s cab—the drivers were instructed to ask no questions. The other passengers of the train would be unaware of the cause of the stop, as the platform was only long enough for the front of the locomotive. After the war, the station was given back to London Transport for engineering access and to use as an emergency exit point. Many of the offices in the tunnels were removed, though those on the platforms remain. London Transport Museum now operates tours of Down Street, showing visitors down the dusty spiral stairs to the darkened and dilapidated corridors, where Piccadilly Line trains rush past just behind metal gates. 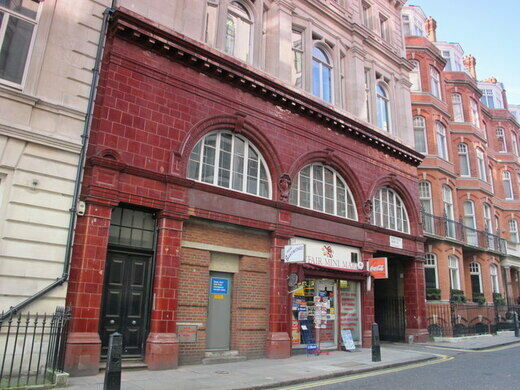 Down Street Station can only be visited on tours operated by London Transport Museum; tickets can be purchased (subject to availability) from LTM's website. The canine-themed book collection claims to be Europe's largest dog library. This overlooked street light once served as a KGB dead letter box.